Is there a word for forgetting what an empty space looked like as soon as it's filled? Perhaps in German? 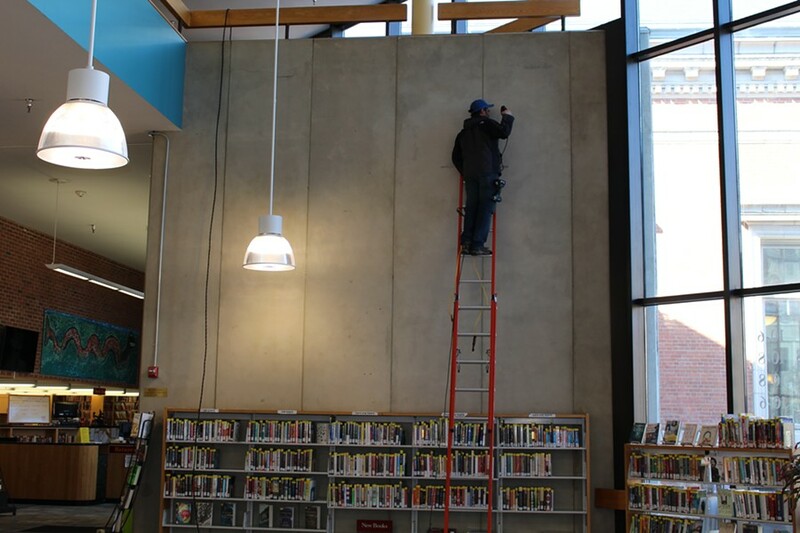 Whatever that word may be, it would be appropriate to address a new and very large addition to the Fletcher Free Library: the painting "Oxyvision with escape hatches (thanks to Tomma Abts)" by Reading-based artist Marc Beaudette. 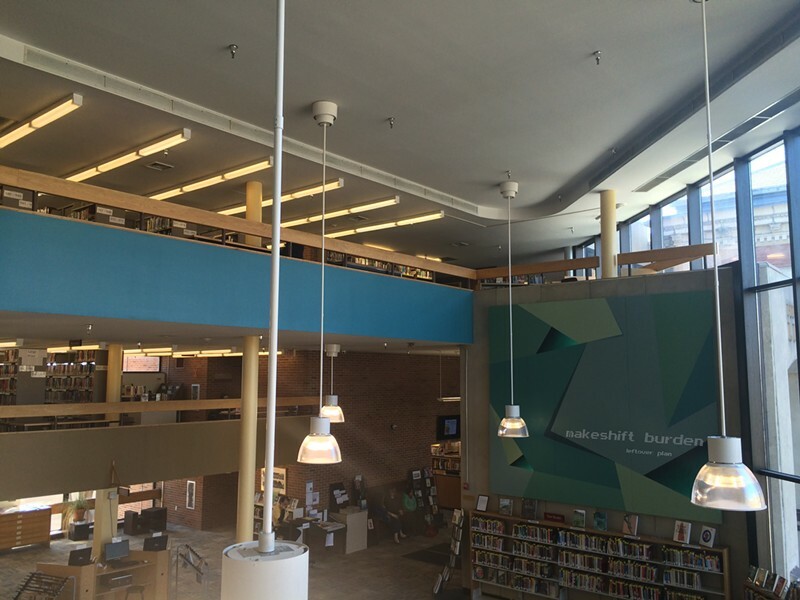 "I'd long noticed that huge, vacant gray space at the library. It seemed like a great place for a painting," Beaudette said during a phone interview. Last year, the artist applied for a Vermont Arts Council grant to create a work for the expanse of empty wall. "I didn't get it," he said, "so I got another credit card." The completed piece was installed on Easter Sunday by a team that included Beaudette, his brother, girlfriend and two library staffers, Tyler Dutile and Dawa Jinpa. "It was almost a disaster," said Beaudette, admitting that the group struggled to hang the 13.75-by-12-foot, 300-pound painting. Drill malfunction, bent brackets and an impromptu rope-and-pulley system were all part of the drama. 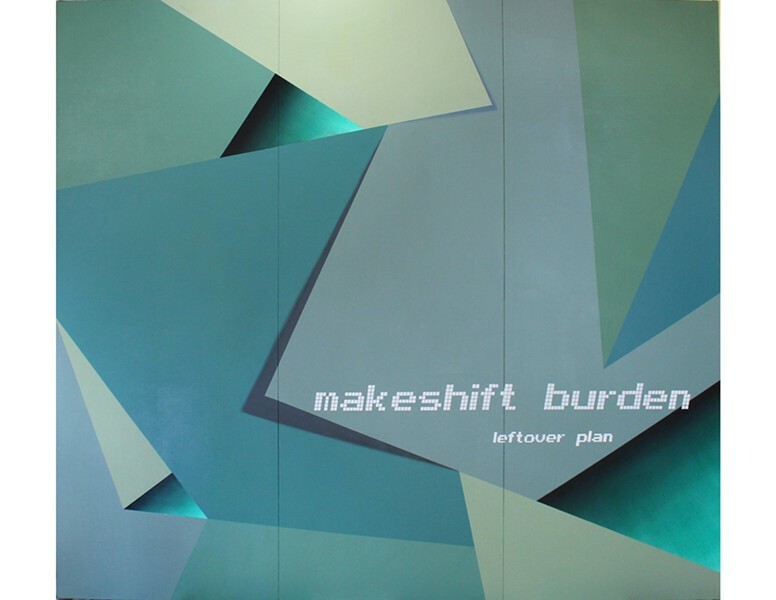 Thus contradiction is key to Beaudette, who identifies the painting's phrases "makeshift burden" and "leftover plan" as oxymoronic. The words, he said, are in "place of product title or corporate logo." The painting's hard-edged abstraction and color scheme brings to mind the clunky graphics of emerging computer technology, as well as pre-fab PowerPoint templates. Beaudette hopes that his contribution to the Fletcher Free will help spur an annual rotation of large-scale works there. "Oxyvision" will remain on view through next April, when the library will have the option to buy it permanently for $10,000. If somebody else buys it first, Beaudette said, the library will receive a percentage of the sale. If nobody buys it, then the wall may return to blankness: "It'd be a vacuum," he said. Library director Rubi Simon indicated by phone that she would be open to rotating artwork in the space. She also noted that, in the past year, the Fletcher Free has gotten a bit of a facelift, with new carpet and furnishings. "We’re definitely seeing more artists wanting to come display their work," said Simon. "When you lighten up a space, it’s definitely more appealing." Whether or not the painting sells or spawns an artist initiative, Beaudette is pleased. "I'm just really grateful that I was given the opportunity to do this," he said. "The library was really cool about it."